In an industry so undeniably obsessed with special effects, it's a rare occasion where a film, or documentary, is released, displaying visuals which are entirely non-computerized - looking equally, if not a substantial more, as beautiful. Released as a BBC production, but picked up in the States as the first feature of Disney's spawned company, Disneynature, Earth has began a whirlwind of documentaries of the highest proportion. Earth was five years in the making. Filmed in 200 locations; in 21 different countries; 1000's of hours worth of footage; 250 days of aerial photography; 40 specialist crew members. These factors all tie in to inform, and amaze, viewers as we watch and follow families in the wild on their migration paths, dealing with our planet's down-spiraling situation involving the decline of ice, rising ocean temperatures and the lack of freshwater - all of which set of a rippling effect of never-ending misery. Traveling across the world with rapid, but cautious, pace, we're introduced to our families. A family of polar bears, a stampede of elephants and a rag-tag group of humpback whales, all trenching across their own versions of land while, inevitably, attempting to stay alive. What we're given is a story of survival and, overall, 90 minutes emphasising the resilience of life itself. The animals remain persistent, almost adventurous, throughout their travels. Never giving up, full of courage and zeal they carefully make their way to safety, all-the-while protecting their young which is heartwarmingly displayed on the screen. Dodging danger whenever it crops it's eager head up, each family run into perpetrators which, in the wild, is something you clearly don't want to do. Caught on camera, each 'clash' is filmed almost Hollywood-like, highlighting how furiously raw the animals' tactics can be. Whether it's an actual clash or merely sea serpents frolicking in their watery haven attempting to catch their prey, each scene is crammed full of suspense, displaying the very best in high octane action - enough to make even Roland Emmerich quiver at the knees. Alongside the beautifully serene wildlife and wondrous scenic shots - ranging from the harsh weathers of the Antarctic to the blazing African deserts - is the music. Unarguably bewitching, and utterly captivating the way the melodies coarse through the scenes like blood through veins, aiding, and exaggerating, how pure, elegant and breathtaking our world can be. Earth is an insight into the wildlife our planet contains and the heartbreaking tribulations they're faced with. An insight which does attempt to inform, but merely to address the increasingly problematic situations which are surfacing on an everyday basis. While the overall tactic is to inform, it dazzles - and i mean it dazzles. 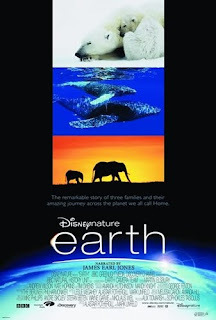 With such exquisite scenes, your initial thought is that Mother Nature herself orchestrated such divine beauty, staging multiple enormously stunning spectacles which transfer so charmingly, and almost spiritually, on-screen, but alas; this is our planet. If you enjoyed Earth, catch the new Disneynature release Crimson Wing: Mystery of the Flamingos, and look out for the up-and-coming fellow features Oceans and African Cats.